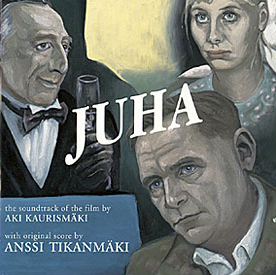 This disc is a condensed version of the music composed by Anssi Tikanmäki for the silent film "Juha" directed by Aki Kaurismäki. The music was composed with respect for the finest Finnish film traditions, scored for a large orchestra and recorded at the JJ studio in Tampere and the Finnvox studio in Helsinki by a band of over 40 musicians. It was mixed at Finnvox in Dolby Digital 5.1 format for the film, but the CD has normal stereo mixing. Thanks to Maarit, Eljas & Eemeli, Aki Kaurismäki, Antti Vihinen, Matti Ruippo, Ira Donner, Sini Perho & Antero Helander (Love Kustannus), Atte Blom, Pekka Aarnio & Anne Koskinen (Johanna Kustannus), Haije Alanoja & Ilkka Mertsola (Sputnik), Kirsi Tykkyläinen (Suomen Elokuvasäätiö), Riku Salminen (Kopio Pirkka) Special thanks to Ana. Terveisiä Sittapiikille. Jakkuli R.I.P. “Le Temps des Cerises”: vocals by Elina Salo, accordion by Matti Rantanen.